Gerard ter Borch situates the quiet, reflective activity of letter-writing in the traditionally boisterous environment of the guard room. Card-playing was a favorite activity of lovers, and the ace of hearts on the floor in the foreground suggests that the letter being written is an amorous one. The shards of clay pipe scattered around the card refer both to merrymaking activities usual in such a room, and to frustrations the letter-writer is having in expressing his romantic feelings. Letter writing and reading--together with guard room scenes--were among Gerard ter Borch's favorite subjects. Here the artist has combined the two, locating the quiet, reflective moment of letter writing within the traditionally boisterous environment of the guard room. 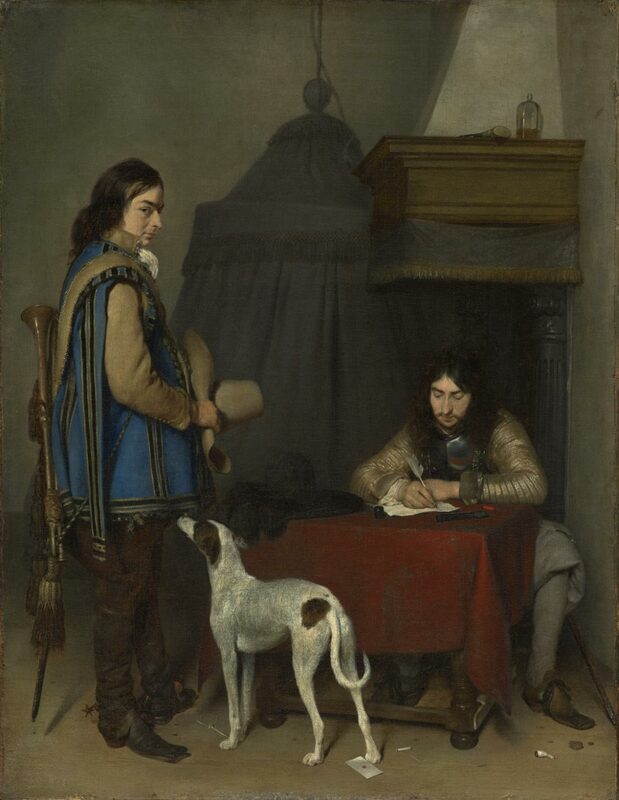 He contrasts the intense absorption of the letter writer with the standing messenger, who waits patiently for the seated soldier to complete his missive. Ter Borch's technical prowess in the representation of luxurious materials, textures, and light in paint heightens the immediacy of the moment. The contents of the officer's letter are suggested by the ace of hearts, a traditional emblem of love, that lies on the floor; card playing itself was also a favorite activity of lovers. The broken shards of clay pipe scattered on the floor attest to the merry-making activities usual in such a room, as well as to the frustrations and difficulties the writer has had in expressing his amorous feelings in a letter. Katherine Crawford Luber, from Philadelphia Museum of Art: Handbook of the Collections (1995), p. 177.